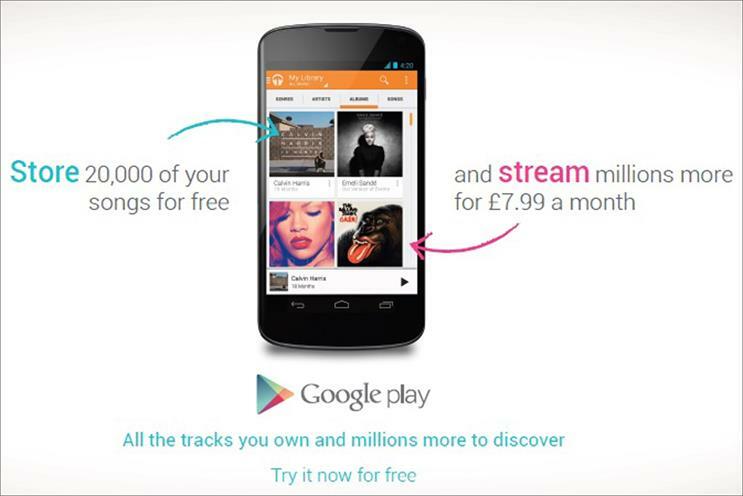 Google has today launched a pan-European ad campaign for its first music-streaming service, Google Music All Access, as it seeks to take on rivals such as Spotify. The campaign, by Isobar UK, introduces All Access, the new subscription service from Google Play Music, Google’s digital distribution platform for music. The service went live in Europe last week and includes access to Google’s music catalogue, free storage of up to 20,000 tracks and a personalised "radio" option, which streams tracks based on a user’s music taste. The radio function is similar to the service introduced by Google Play's primary rival Spotify in 2011 and pioneered by Last.fm. Isobar created the marketing campaign, which spans OOH, print and digital. The agency, recently renamed from Glue Isobar, worked with Essence on the digital media and OMD UK on print and OOH. The campaign imagery aims to reflect Google’s simple aesthetic, with plain ads featuring plenty of white space around the product. The six videos in the digital campaign tell personal stories about people’s relationship with music. The activity will run in France, Italy, Spain and the UK. Further video content is planned for the autumn. Isobar’s UK office works with Google on a project basis and was appointed to the international Google Play account in May, after a competitive pitch. Nick Bailey, the executive creative director at Isobar, said the work was "a conversation-starting campaign, which perfectly reflects the popular, human essence of the Google brand". Adam King was the creative director for the campaign and Mark Light art directed it.